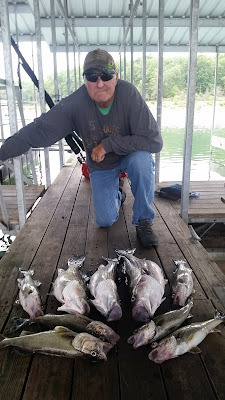 There have been a few changes in fishing on Norfork Lake since my last report. First of all, the surface water temperature has dropped to 79 degrees at sunrise but increases slightly during the daylight hours. Secondly, the thermocline is dropping very slowly and currently sits in the 35 - 40 foot range. The drop in the thermocline at the end of summer is very common. Thirdly, the bigger bass are finally starting to come out of their deep water summer pattern and are feeding in shallower water early in the morning. 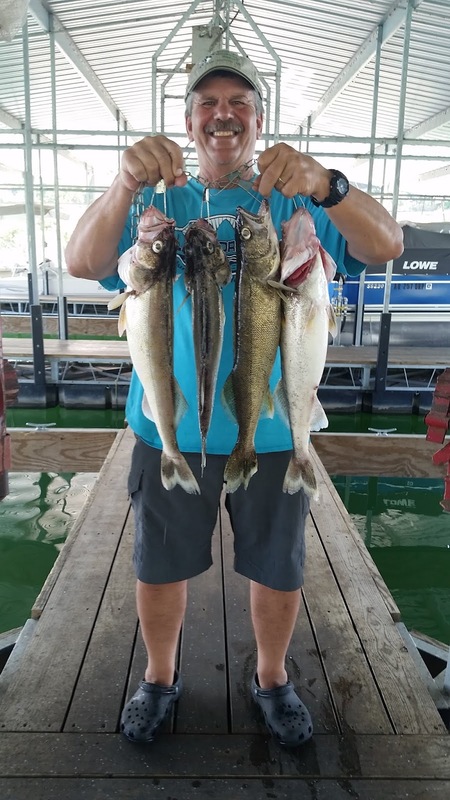 Norfork Lake's walleye bite continues to be outstanding. There have been several methods of fishing for this species at amazingly different depths. Near the dam you can catch walleye in 80 feet of water plus or minus 10 feet. The fish are lying on the bottom or very close to it. Live bait and vertical jigging with a spoon are both working well. If you are vertical jigging with a spoon you don't need to work the bait fast. Drop it to the bottom, then lift the bait 3 to 4 feet off the bottom by raising your rod, then let it fall back to the bottom. Repeat until your bait gets real heavy then reel in your fish. A third method that is also catching a few walleye is trolling swim baits with down riggers. This deep water bite for walleye will not last much longer so you better get on the lake and catch a few. The second location is in shallower water 30 - 35 feet, again on the bottom or close to it. This morning (9/25) I found several nice walleye off of a shallow sloping bank out in the main lake area. The walleye are starting to move onto the flats at approximately 32 feet of water level. I caught my walleye by moving slowly with my trolling motor and stayed in 30 - 35 foot range. I kept bouncing my 1/2 ounce spoon off of the bottom. You can also troll slowly with a crawler harness with a bottom bouncing weight. 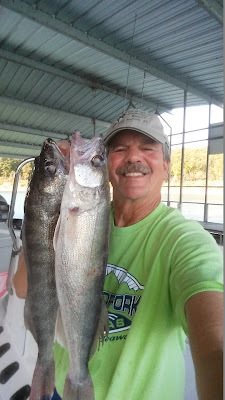 It is amazing how many walleye there are in Norfork Lake. Striped bass are still in the dam area in deep water. 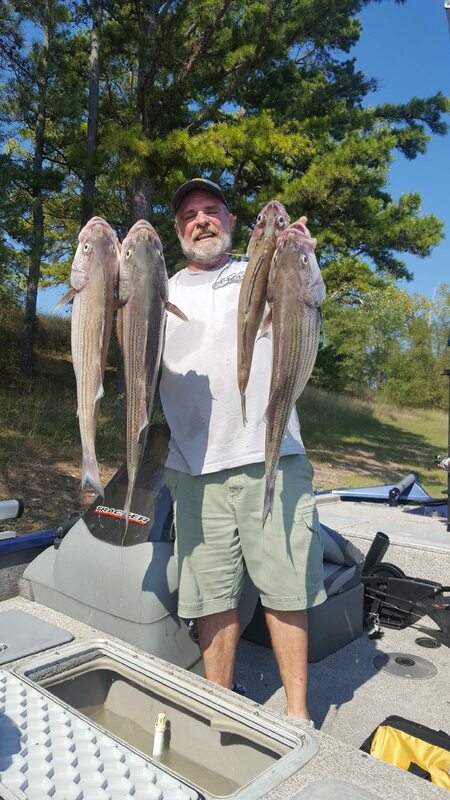 Live bait is working the best, but spoons and trolling swimbaits are also catching a few good fish. This species is also in the 80 foot range on the bottom or suspended in the deep water channel, but they are staying at the 80 foot level plus or minus 10 feet. I don't expect these fish to stick around in the dam area much longer. 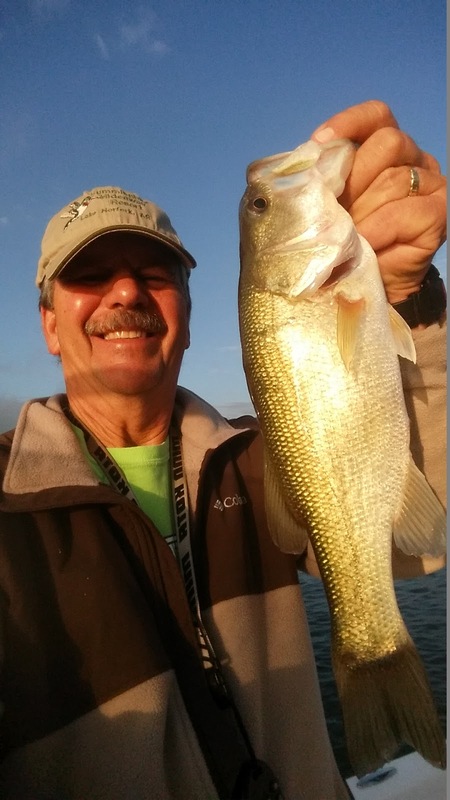 The largemouth and spotted bass bite is improving quickly with the cooling off of the water. 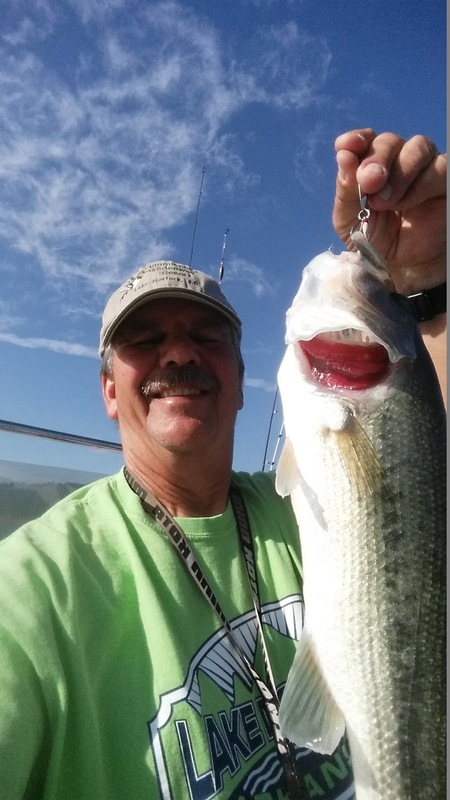 I am starting to find and catch larger sized fish in shallower water. This morning I found some good topwater action for bass close to the start of a large flat. The fish were at all depths. Some were chasing shad next to a chunk rock shoreline all the way out to the start of a flat. I was sitting in 30 feet of water and could see fish coming up in 10 feet of water, as well as, out in 60 feet of water. Most of the deep water fish were whites chasing shad, but there were some nice spots mixed in. I was casting a 1/4 ounce Kastmaster with a feather trailer. There was a lot of bait in the area and the bass stuck around for well over an hour. I ended up leaving with the fish still exploding. What fun! Norfork Lake level is holding fairly stable with minimal power generation and currently sits at 551.74. The lake surface water temperature has dropped to 79.4 this morning based on my depth finder. The main lake is clear and some of the creeks and coves are somewhat stained. Norfork Lake is in great shape.